This comes from Moviehole...A few months back Bloody Disgusting announced that development had started on a second sequel to [Gore Verbinski's U.S remake of] "The Ring".Today, Heat Vision added that the flick will be in..... 3D! (Yeah, I don't know why I just added an exclamation point there - maybe I should've just typed that whole last sentence in CAPITALS since that's usually someone's way of letting others know that they're pissed off with something - so I'm told by my fellow typists - and, well, I'm definitely not smiling about this seemingly unremitting 3D trend). It has now been officially confirmed that Dr. Gordon will return in the seventh installment of the Saw franchise. Some of you, after so many sequels, may be asking yourself, "Who's Dr. Gordon?" 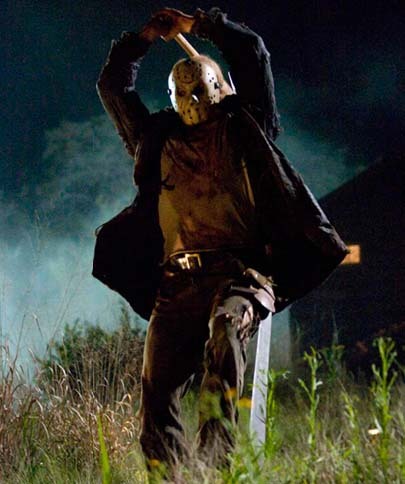 Well, you have to go all the way back to 2004, in Saw I...remember, Dr. Gordon is the guy who sawed his foot off. Well, he's back! This information was made available to me through the official, and annoying, Saw newsletter via e-mail. "it is dead- not happening"
"Right now there is no movement on Friday 13th: Part 2." This bit of news comes from Moviehole...and it's pretty interesting as well...Robert Downey Jr is off to Munchkin Land. Maybe. Possibly. 'Star Wars Episode 7' In The Works? This utterly AMAZING news comes verbatim from Moviehole...Finally, the more dimish inmates of the South Naboo Penitentiary can discover what lay ahead for Luke, Leia, Han and pudgy Wicket after the events of "Return of the Jedi". The rest of us, being able to read and all, have known for years what happened to the Skywalker siblings and the rascally smuggler - Han and Leia, of course, produced twins (later Jedi's themselves), the rebels faced a further battle with the Empire - trying to save the planet Coruscant (the character of 'Wedge' plays a big part in this arc of the story), and Grand Admiral Thrawn replaces the recently-departed Darth Vader as the galaxy's big bad. Geena Davis recently spoke to Moviehole about the possibility of a Beetlejuice sequel. This is how that article went...Out stumping her new film "Accidents Happen" in Sydney (where the Andrew Lancaster-directed comedy was shot), screen vet Geena Davis mentioned she'd be interested in hearing more about the oft-rumoured "Beetlejuice" sequel. Davis, who played one-half of the recently-departed Maitland outfit (Alec Baldwin playing her hubby), says she'd be definitely keen to tap into her, er, 'spiritual' side again. "It's funny, [another journalist] just asked me about a sequel to Beetlejuice - which, though I haven't heard anything about it, might be interesting", Davis told me yesterday. "I would do that!". The casting news for Scream 4 just keeps getting stranger and stranger. Back in 2008 it was rumored that Jamie Kennedy might be reprising his role as Randy in the third sequel to the mega-hit Scream, and just a few weeks ago Liev Shrieber was rumored. Remember, both of these characters met their maker in previous installments. Here's what CHUD is reporting...When Jamie Kennedy's Randy was killed in Scream 2 it was both a brilliant move - he was the audience identification character, and so we felt his death - and a bummer. I always thought that Randy was one of the better movie geek cliche characters, and his presence was missed in Scream 3. Patrick Lussier recently spoke to MTV about his new movie Drive Angry. 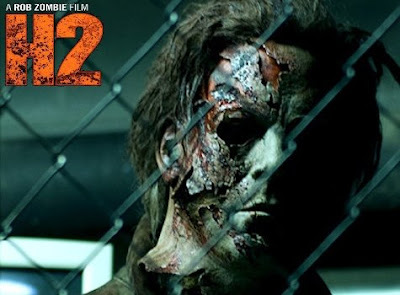 And, of course, the topic of Halloween came up...The film that we wrote took place, like, the next frame after Rob's 'Halloween II' ended and immediately went into stripping Michael Myers back to his John Carpenter roots," Lussier said, referring to the creator of the "Halloween" franchise. "That's what we did very quickly. And then you pick up the story a year later as Halloween rolls around again. Everybody's back in the fray. That was our goal. Here's a little news on American Pie 4, a direct sequel to American Wedding, courtesy of Moviehole and THR...In addition to writing the film, "Harold & Kumar" creators Jon Hurwitz & Hayden Schlossber will be directing the fourth "American Pie" movie. As a consequence of the duo's anointment to the "Pie" reboot, they've had to hand the directing reigns on "A Very Harold & Kumar Christmas", filming this Summer, over to MTV alum Todd Strauss Schulson (Risky Business). Yummy. And the remakes just keep on a-rolling...this comes from Pajiba...Funny thing about scoops: Breaking the story that 20th Century Fox was developing a movie based on the E*Trade talking babies yesterday actually had the effect of breaking loose another story. A related story. A story as bad as, but probably no worse than the E-Trade movie. It is this: Neal Moritz (Prom Night remake, I Am Legend) is producing a Look Who’s Talking remake. Yes: The king of the talking baby movies is returning. The one that started it all, racking up nearly $300 million worldwide and spawning two sequels. They’re remaking it. Making it again. Doing it over.